Gerardo Esquivel´s recent No hay dos Méxicos blog is right in stating that, contrary to the recent McKinsey´s report (A tale of two Mexicos: Growth and prosperity in a two-speed economy), in fact there is only one Mexico. In a recent work that I co-authored with Mariana Pereira (Local Multipliers and the Informal Sector in Mexico 2000-2010), we analyzed the multiplier effect in the local labor market when Mexican metropolitan area attracts new firms in the tradable sector (i.e., those in the “modern, fast-growing Mexico, with globally competitive multinationals and cutting-edge manufacturing plants” according to the McKinsey report). We found that for each new job created in the tradable sector, about three nontradable new jobs are created: one also in the formal sector and the other two in the informal sector. 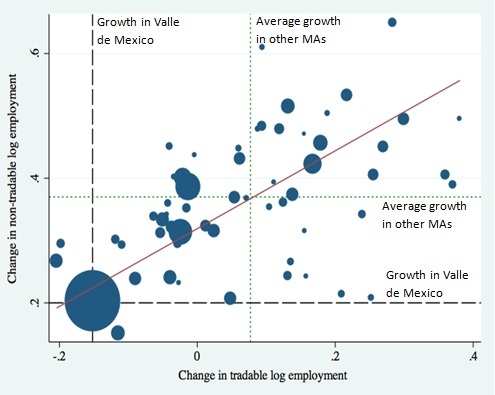 Figure 1 shows the correlation between tradable employment growth and nontradable employment growth in the 2000-2010 period for the 58 Mexican Metropolitan Areas (MAs). As it can be seen in the figure, there appears to be a direct relation between these two variables, consistent with the theoretical model used in our paper. The graph shows the relative importance of Valle de Mexico in terms of employment (it concentrated more than 30% of tradable MAs employment and more than 35% of nontradable MAs employment in 2000) and also that growth rates for other MAs with high levels of nontradable employment in 2000 were above the mean for nontradable employment, but below the mean for the tradable sectors. These growth patterns are an indicator of the increasing role of the services sector in these large MAs, which have a higher proportion of non-formal jobs than the non-services sector. Source: Pereira y Soloaga (2013) .The markers’ size reflects nontradable employment in 2000. Thus, the employment structure appears to reproduce itself as new jobs created in the tradable sector (which has a much lower informality rate than the nontradable sector) generate in turn formal and informal jobs in such a way that the current “Mexican-mix” (roughly 50% in each sector) is replicated. This is not a desirable outcome considering the low tax collection and vulnerability to labor market shocks associated to informality. Moreover, it tells the story of only one Mexico, where the new modern firms act as enclaves. Thus, although attracting new firms could be one of the ways to get higher growth rates in Mexico, current trends point to the need of considering the degree and quality of their linkages to present local markets, and the extremely low spillover effects.